Sucie and Susan are waiting for a new home. I hope I can find a good home. This is a beautiful dog found in a trap. She has 3 legs after the surgery. Ivy ( a kind lady ) rescued her and is fostering her. Now what she needs is a permanent home. 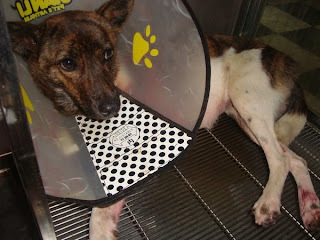 Please contact Ivy at ivy_chuang@mail.sch.com.tw or call 0955180155, if you are interested in adopting her. She can also be adopted overseas. age: 1 year old. personality: very nice, doesn't bark.